By Melissa Chong, Channel NewsAsia, 1 Jul 2012. It has been one year since the closure of the Tanjong Pagar Railway Station. On Sunday, visitors got a chance to explore the heritage site. For the early risers, there were guided tours organised by the Nature Society of Singapore. Others chose to hike the entire 10 kilometres from Bukit Timah to the Tanjong Pagar Railway Station. But the highlight was the station itself, where over 100 visitors turned up to learn about its architecture and history. By Lisa Oon, my paper, 2 Jul 2012. For Mr J. Tang, 57, a technical officer, going to Tanjong Pagar Railway Station yesterday brought back memories. Only five when he moved to Singapore from Thailand with his parents, he remembers fondly the days when he stepped into the station. He recalls eating fried rice and eggs done sunny side up on the train. “I still remember the taste,” he said. 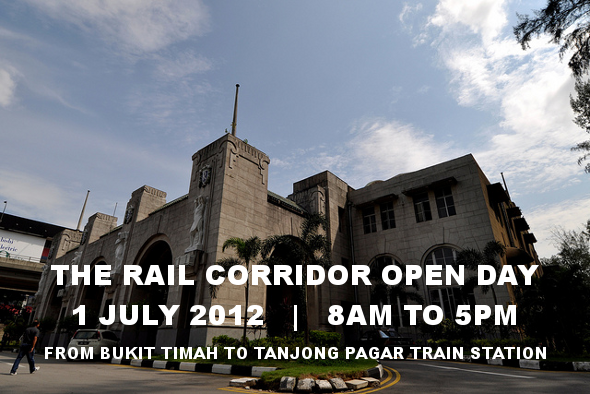 The Rail Corridor Open Day is held on 1 July to allow the public to enjoy the biodiversity and heritage of the Rail Corridor, and to explore the Tanjong Pagar and Bukit Timah Railway Stations. This event is organised by Friends of the Rail Corridor and Nature Society (Singapore).